PSNI Global Alliance has named Viewhaus Sistemas of Guadalajara, Mexico and Level 3 Audiovisual of Mesa, AZ as the “Best Places to Work in AV” in 2018. This award recognizes members of PSNI Global Alliance who exceed key employee-performance metrics identified by the PSNI-exclusive Employee Engagement Survey. 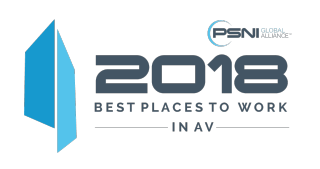 Based on an analysis completed by an independent research firm, PSNI Global Alliance awarded Level 3 Audiovisual the "Best Place to Work in AV with Over 50 Employees” while Viewhaus Sistemas was named the "Best Place to Work in AV with Under 50 Employees” award for 2018. The research show that. overall, 85 percent of employees at PSNI Global Alliance-affiliated companies are satisfied with their employment and 94 percent of employees like the type of work they do for their employer.